Richard Lester's hilarious, high-energy A Hard Day's Night is the story of The Beatles' popularity explosion from the band's perspective, as they deal with obsessed fans, heightened expectations and the pressure of performing live. We get to know John, Paul, George and Ringo as goofballs living a rock-and-roll dream, an coping with the hassles that accompany that lifestyle. 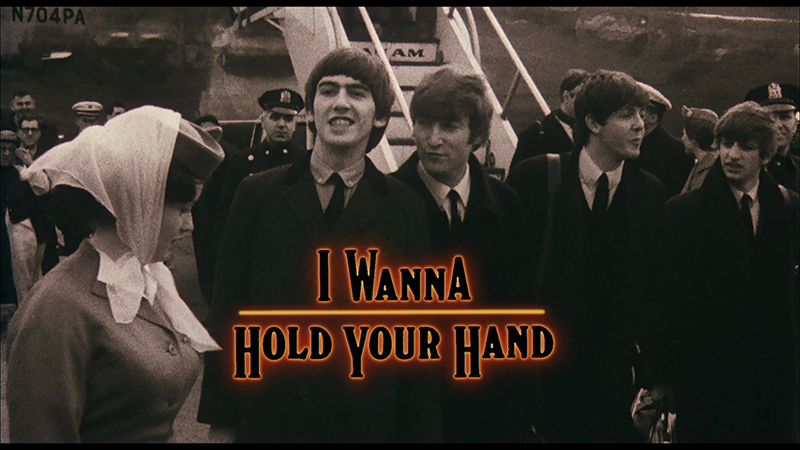 The other side of the story, that of the fans in the grips of Beatlemania, and their dreams of getting to see, touch and know the band, get their own spotlight in Robert Zemeckis' feature debut, I Wanna Hold Your Hand. Rosie (the always delightful Wendie Jo Sperber) is your stereotypical Beatles fanatic, losing her mind over everything to do with the band, to the point where when she hears about a chance to win tickets to see the group on The Ed Sullivan Show, her reaction is to throw a handful of dimes at the phone in a fit of panic that she may miss out on her chance. Her would-be photojournalist pal Grace (Theresa Saldana) has a plan though that may let them actually meet the Beatles: all they need is to take a limo from Jersey to the Beatles' hotel in New York City, and they can walk right in (since limos aren't being stopped by police.) So, enlisting the help of naive Larry (Marc McClure) and his dad's funeral limo, Rosie, Grace, their soon-to-elope friend Pam (Nancy Allen), and anti-Beatles crusader Janis (Susan Kendall Newman) hit the road to sneak into The Plaza Hotel. Once in New York, the group--which has been joined by Jersey rabble rouser Smerko (Bobby Di Cicco)--head off on their separate paths to achieve their goals. Rosie's battering-ram technique brings her into the orbit of Beatles superfan "Ringo" Klaus (Eddie Deezen), Grace tries to make her way via a series of schemes, while Pam manages to get herself delivered directly into the Beatles' suite (Janis, Smerko and a young Beatles' fan they get involved with are mostly tertiary characters, which is for the best, as they lack the appeal of the core three characters.) Their various misadventures as they attempt to get close to their idols are delightful to watch, as their personalities are all played to the hilt, whether it's Rosie's enthusiasm, Pam's emerging self-awareness, or Grace's ambition. The idea of trying to get to see a big concert seems like such a natural plot--with the built-in ticking clock of the concert's start and the heightened emotions of music fandom--that it's surprising that it's not seen in more movies (the only ones that jump out are this film and 1999's Detroit Rock City) but perhaps it's because of the challenge of finding a band with enough universal appeal and then figuring out how to get the band and their music into the movie. 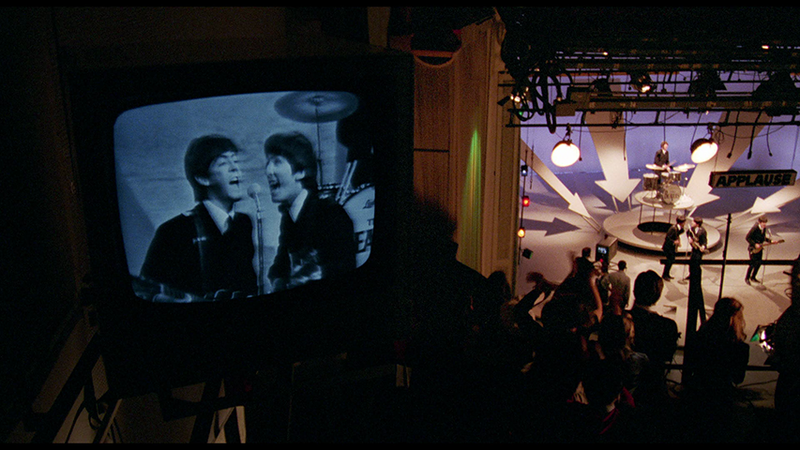 Zemeckis and company took the tack of using archival material and fleeting glimpses of the icons (whether at a blurry distance or via obstructed view) to suggest their presence, while the Beatles' music filled in the gaps. 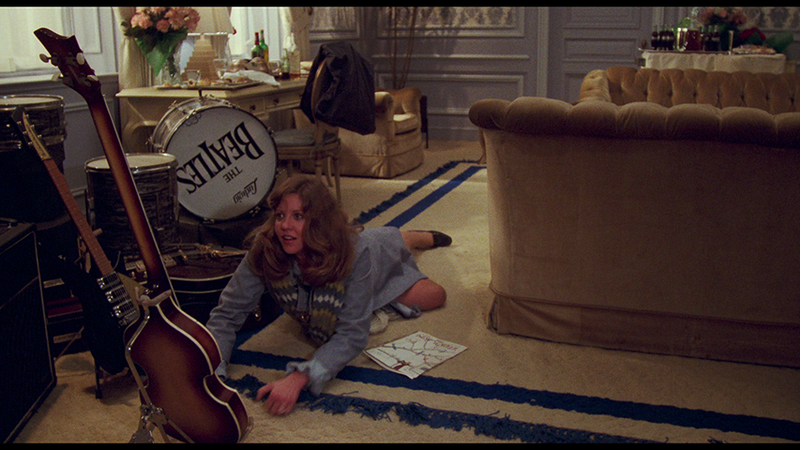 Keeping the band out of sight actually helps the audience share the experience of the three lead characters, as the Fab Four are always just out of reach or out of sightline. Though I Wanna Hold Your Hand isn't Zemeckis and Bob Gale at the height of their storytelling peak (their plots got stronger and more cohesive with time and practice), all the elements that would make them some of the preeminent popular filmmakers of their generation are on display here, including their eye for nostalgia, their ability to tie together multiple plot threads, their willingness to be completely crass when necessary, and their ear for propulsive, yet smooth dialogue. Each main character has a relatively complete story in the end (even if Rosie's lacks the stakes of her friends') and even if the resolution is a bit convenient, the energy and goodwill Zemeckis has created carries the action over the finish line. I Wanna Hold Your Hand (Criterion spine number 967) arrives on one Blu-ray disc in a clear keepcase with a dual-sided cover (featuring a moody shot of the Sullivan stage on the inside and a seemingly Sam Viviano-influenced illustration on the cover) and a fold-out, eight-panel pamphlet. The traditional Criterion menu provides the choice to watch the film, select scenes, adjust languages and check out the special features. There are no audio options, but subtitles are available in English. Supervised by Zemeckis and Gale, the 1.85:1 transfer on this release is struck from a new 4K scan of the original 35mm camera negative, with a large-scale clean-up of the damage in the source. The resulting image (which sports slight letterboxing) is simply beautiful, using rich, vibrant color and a hefty amount of texture and cinematic grain to portray the film's timeframe as warm and touchable, while the archival footage utilized to integrate the reality of the Beatles with the fiction of the teens looks sharp, yet not artificially so. Though often shot on backlots and sets that stand in for the original New York City locations, the scenes look rather authentic, and the details hold up to the enhanced high-definition presentation. As the film is set in the Northeast of America in February, there's a lot of winter clothing on display, which adds tremendous amounts of detail to the costuming, The clean-up has left the film free of any notable flaws, resulting in a very pleasing image that handles the complex crowd scenes without problem. The 5.1 DTS-HD Master Audio track was previously crafted by Universal from the original 35mm magnetic track in 2004, and was approved by Zemeckis and Gale. Surprisingly action-heavy, with several car scenes and hyperactive crowds, the film actually gives the track plenty to work with, and the sound is up to the challenge, using the surrounds to deepen the field, while dialogue is crisp and easy to understand. Music is obviously a big deal--though there is no score--and the side and rear speakers help boost the many Beatles tunes, while sound effects are appropriately prioritized in the mix. Carried over from Universal's 2004 DVD is a commentary by Gale and Zemeckis, and it's a very welcome re-run, as they have plenty of production stories--especially when it came to their struggles with unions--to share on this foul-mouthed, free-wheeling chat. There are so many great tales shared, from issues with audio to problems with the studios to a run-in with Paul Newman. Because of the extensive range of topics covered in their commentary, there's definitely repetition in some of the other extras, but better to double-up than leave something out. While hearing from Gale and Zemeckis is what anyone would want when it comes to this film, add in executive producer Steven Spielberg and it just gets even better, and a 41:57 video interview with the three is everything you could ask for outside of a full-length commentary with the trio. They go over how they met, their work together, the development of the film and putting together the cast, and Spielberg's role on the film. There is some classic Hollywood business history shared here, but it never gets better than when Spielberg actually learns things about the film during the interview. If hearing about how the sausage is made is your thing, this is catnip, as they get into serious detail about the production of the movie. Criterion sometimes included early student films of great directors, and they've done that for Zemeckis, offering up two of the movies he made at USC: 1972's The Lift (7:21) and 1973's A Field of Honor (14:16). The Lift is a moody, wordless, black and white story of a businessman, whose technology-enhanced efficiency is undone by a malfunctioning elevator, while A Field of Honor--the film that caught Spielberg's eye--is the insane tale of a disturbed man who wanders through a nightmarish day full of gunfights and military-fueled madness. Both are obviously the work of someone with genuine filmmaking potential, and are thus engaging curiosities, but it would have been nice to get something from Zemeckis (and Gale, who was involved in both) to give context to the films, like Criterion did with Alexander Payne for their Election release. Putting a cap on the disc is the film's 1:10 trailer, a pretty straightforward, plot-driven promo, and 5:24 of radio spots. In these six clips you'll get some really unique attempts to promote the movie, from a lengthy montage of unconnected clips that mean nothing, to an undead Ed Sullivan to fake audience responses. Hard to understand why the film didn't set the box office on fire with ads like these. The extras wrap up with the 8-panel fold-out pamphlet, which includes, alongside the disc and movie details, an essay by film writer Scott Tobias, who analyzes and breaks down the film's themes and places the movie into the context of Zemeckis' career. An enjoyable counterpart to A Hard Day's Night, I Wanna Hold Your Hand offers the kind of silly, slapstick comedic action that doesn't usually feature a female core cast, putting Robert Zemeckis and Bob Gale ahead of the curve, as their charming trio of young ladies chase their dreams of getting to meet the Fab Four. Sure, there's a bit of padding as some of the less- engaging characters help pace out the lean plot, but they don't take away from the film's highlights. Criterion has delivered the film in great shape, and added some excellent new extras to quality archival material, ensuring this will be the definitive release of this film.